China is not alone in constructing coal-fired power plants. According to Urgewald, about 1,600 coal plants are planned or under construction in 62 countries; this data comes from the Global Coal Plant Tracker portal. If constructed, these new plants would increase global coal-fired capacity by 43 percent. According to Urgewald, 11 of the world’s 20 biggest coal plant developers are Chinese. Chinese companies are expected to construct between 340 and 386 gigawatts of the new coal capacity worldwide. Shanghai Electric Group announced plans to build coal plants in Egypt, Pakistan and Iran, with a total capacity of 6,285 megawatts—9.5 times the 660 megawatts of coal power it plans to build in China. In Egypt, coal projects by Shanghai Electric and other developers would bring the country’s coal-fired capacity to 17,000 megawatts, up from almost zero today. Also, Pakistan’s coal capacity is set to grow to 15,300 megawatts, up from 190 megawatts today. The China Energy Engineering Corporation, which has no public plans to construct coal plants in China, is building 2,200 megawatts of coal-fired capacity in Vietnam and Malawi. Planned coal projects in Malawi would bring its coal-fired capacity to 3,500 megawatts, up from zero today. In China, there is little demand for new coal power due to its slowing economic growth. But Chinese companies are able to capitalize on the global coal market due to strong infrastructure demand in developing countries and a sharp decline in coal financing by the World Bank and the Asian Development Bank. China is helping these companies construct coal-fired power plants overseas through its state initiative called “One Belt, One Road,” which allows for up to $900 billion in infrastructure investments overseas including high-speed railroads, ports, gas pipelines and power plants. Since 2000, China’s global policy banks (the China Development Bank and the Export-Import Bank of China) have provided over $43 billion in overseas coal financing. 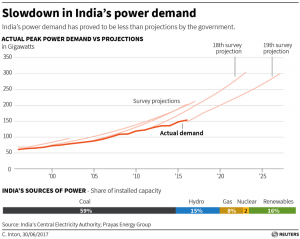 As in China, India’s power demand is slowing despite many citizens living without power. Over 300 million of India’s 1.3 billion people are still not connected to the grid. As grid connections improve, the country’s per-capita power consumption could increase by about a third from 2012 levels to 2,924 kilowatt-hours by 2040. Around 78 percent of India’s electricity currently comes from coal-fired power plants. 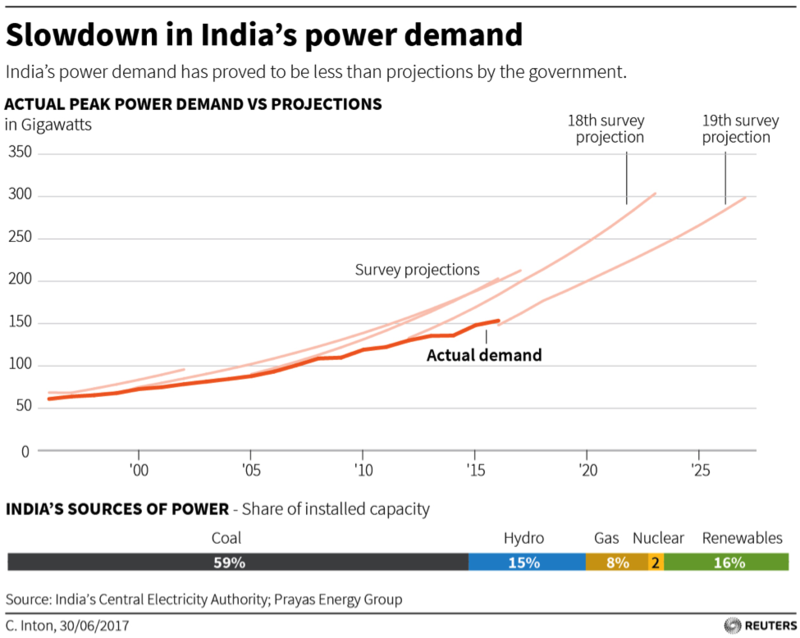 As India brings electrification to more of its people, carbon dioxide emissions from India’s thermal plants are expected to increase to 1,165 million metric tons by 2026/27 from 462 million metric tons in 2005—a factor of 2.5 in slightly over 20 years. Its emission intensity, carbon dioxide emissions per unit of GDP, however, is expected to decline. Besides building supercritical plants, India is also planning to retrofit several coal-fired plants with emission-reducing equipment. China and India, ranked first and third globally in greenhouse gas emissions, are planning to build coal-fired plants at home and in other countries to bring electrification to the developing world and to continue to grow their economies. While both countries have ratified the Paris climate agreement, they will continue to do what their populations need with respect to power generation and will also continue constructing coal-fired plants around the world.